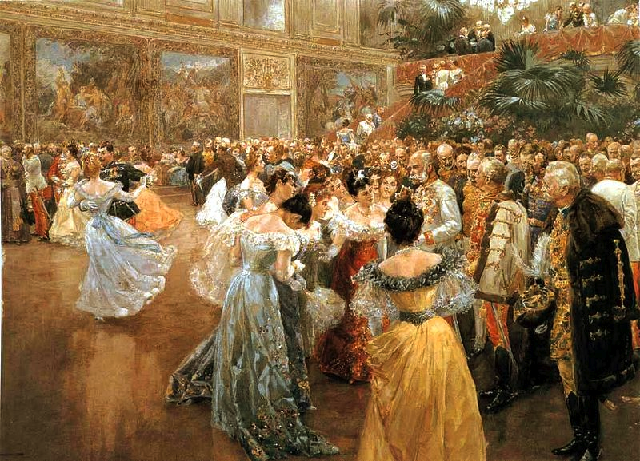 In Vienna, Franz Joseph being fawned over by fun loving high society ladies. Europe's first great war of the twentieth century had roots deep in history: conquerors holding that they had the right to rule people without their consent and that the gods approved or had directed the conquest. It was a heritage that belonged to much of Europe. Across millennia the world going into the twentieth century was at a high point in technological development, which would impact the character of the coming war. Growing populations made the possibility of massive conscript armies that changed warfare. From an army chasing another army across an expanse of territory – like Alexander the Great chased Darius III – there would now be long warfare fronts. By now, warfare among industrialized societies would involve the productive and financial capacities of an entire society. And modern communications accompanied a rising nationalism, which was an ingredient in the coming war's creation. Regarding war, it was a new world that was challenging Europe's intellectual life. From Vienna the Habsburg monarch, Franz Joseph I (Francis-Joseph I), ruled by right of birth – an ages-old institution. Like other monarchs the Habsburgs had extended their rule where they could and called themselves emperors. Franz Joseph and other monarchs thought this right and proper, the monarchs reinforcing the rightness of it for each of them. And there was the approval of their loyal subjects who were awed by the tradition and grandeur. Some looked upon their king, or emperor, as a father figure. And helping Franz Joseph in seeing himself as right and good was supported by his church, which blessed and dignified him and saw him as defending and spreading the faith. Emperor Franz Joseph, Vienna, circa 1910. Despite his sense of propriety, he was foremost in bringing the worst war yet to the world. The imperialism of emperors conflicted with nationalism and people wishing to be rid of foreign rule – especially strong in the late 1800s and early 1900s and extended into the twentieth century – to be called the century of hate. Peace benefited trade and a nation's economy, but emperors were not dominated by the idea of maintaining peace for the sake of economic well-being. The imperial tradition glorified warfare, and at this point in history a lot of influential people still saw warfare as providing their fellow countrymen with the manly spirit necessary for national success. As for empires, Tsar Nicholas II of Russia had an empire that extended to Germany's border and included Turkic peoples. The Habsburg monarch Franz Joseph ruled over an empire that included Germans, Hungarians, Czechs, Slovaks, Slovenes, Croats, some Poles, Ukrainians and Serbs. And Turkey controlled an empire that included Arabia, Palestine and North Africa. As men of power by accident of birth, monarchs were not always the brightest of men or equipped to challenge tradition. Franz Joseph wasn't thought of as intellectually bright or accomplished. People were judging their leaders by other standards. Franz Joseph had always worked diligently, rising to attend to his duties before dawn. He was courteous and kind to those around him. He loved his wife and was fervently devout. Franz Joseph was moved to keep his empire as great as it was when he had inherited it. In the 1860s, after a short and bloody war against Italians and the French, he was forced to give up rule in northern Italy, but he never accepted the loss of his Italian lands, and to compensate for that loss he decided to extend his rule into Bosnia and Herzegovina. Bosnia and Herzegovina had been a part of Turkey's Empire. In 1878, Europe was taking charge of some of Turkey's European empire. With the approval of the Congress of Berlin, the Roman Catholic Franz Joseph sent an army of 200,000 men under banners with the image of the Virgin Mary, into Bosnia and Herzegovina, believing that he was subduing an inferior people. The Catholic minority in Bosnia welcomed Franz Joseph's army, while Muslims and Orthodox Christians fought the invasion. In Sarajevo the fighting was from house to house and hand to hand. After two months of fighting, Franz Joseph's army overwhelmed its opponents, while suffering more than 5,200 killed in action – sacrifices for the glory of God and the Habsburg Empire. The Congress of Berlin recognized Franz Joseph as having temporary control over Bosnia and Herzegovina while the area was to remain nominally a part of Turkey's empire. Franz Joseph had succeeded in extending his empire to what he saw as its rightful size. He had pushed into an area where for centuries Roman Catholicism had been in bitter rivalry with Eastern Orthodox Christianity. 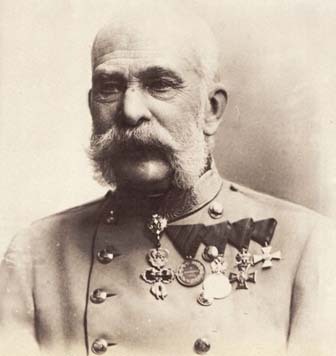 Franz Joseph had not only won Bosnia and Herzegovina, he had won an unending conflict with the Serbs, including the nation of Serbia, whose independence had been formally recognized at the Congress of Berlin. The people of Serbia believed that their fellow Serbs in Bosnia and Herzegovina should be allowed to be a part of a greater Serb nation. Complicating what would be a continuing conflict between the sentiments of Serbs and the interests of Emperor Franz Joseph was an alliance game among Europe's major powers.